Schladming-Haus is one of the great locations of the ski world, with our hotel at Haus im Ennstal looking out on the beautiful Dachstein-Tauern peaks. Four interlinked mountains provide a huge variety of pistes for all to enjoy and are popular as a training area for World Cup ski racers. We ski right to the door of our welcoming hotel - an ideal location for a week of the best mountain adventures! The nearby Hauser Kaibling gondola takes us up to the highest point of the Schladming inter-linked mountains and from here there is an amazing 360 degree panoramic view over the upper Ennstal valley. "A first rate holiday - well run, good value and great people!" The extensive Ski Amadé area provides guaranteed snow with widespread snowmaking facilities and the impressive Dachstein glacier. From the glacier exceptional views over the Styrian province of Austria towards Salzburg can be enjoyed. sauna is an added bonus. After an exhilarating day of skiing, we can enjoy an appetising 3 course meal served to us by the friendly staff. The comfortable bedrooms are all en-suite. There are a number of rooms for 3 or 4 and also some smaller rooms available. Many of the beds are Austrian-style (one frame with separate mattresses and duvets). A continental breakfast will be served each morning and delicious Austrian bread and fillings will be available for packed lunches. "Thanks for all the organisation back at base... we are hugely grateful for a great time of physical and spiritual refreshment." 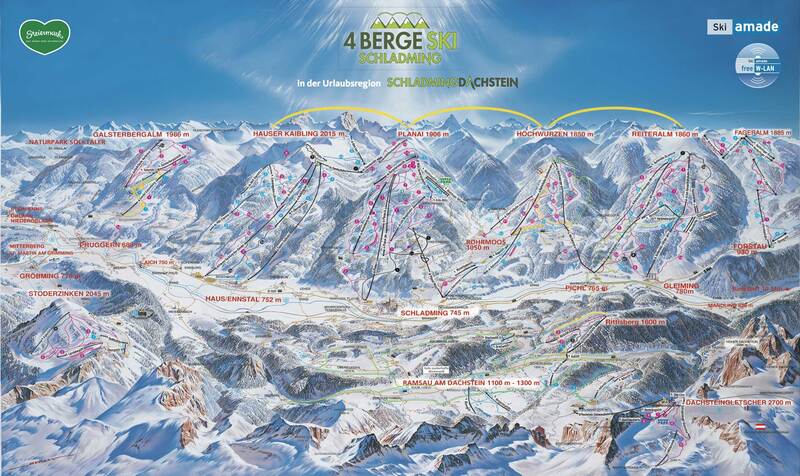 Please click here to see the piste map of the massive area around Schladming covered by the optional lift pass. More about ski passes with Oak Hall can be found here. The Pension boasts an exclusive café open each evening for us. Here we enjoy chatting with each other and listening to stories from the Hofer family; we are also able to relax with table tennis, board games and a quiz. One evening we will go out and play “cricket” with traditional Austrian skittles; another evening we go out for ice cream; and sometimes the local ski team put on a show.